This review first appeared in DNA India on April 12, 2015. Where does the Ramayana end? When Sita returns to Ayodhya with Rama? Or is it when she is banished to the forest? Or when Rama is captured by his own sons and Sita returns to Mother Earth? Or when Rama's life on earth finally comes to an end? What about Hanuman? Oh, but he is one of the few immortals. With the Mahabharata one can ask similar questions - where does it end? For most of us the answer may be - after the eighteenth day of battle. That would be true in many ways, but it is not the complete truth. What about Gandhari's curse? When did that take effect? What happens to the Pandavas after that? What about Dhritarashtra and Gandhari - the now defeated king and queen? With the Mahabharata, one is even tempted to ask - where does the epic begin? Do you start with the grandson of Arjuna, Parikshit? His birth takes place a few months after the war has ended at Kurukshetra, and in the story, it is described only in the 1900th chapter - seventy thousand shlokas after the start and less than a hundred chapters from the end! In many ways, Parikshit's end - at the hands of Takshaka - is what brought about the first public retelling of the Mahabharata. Actually, like many things with the Mahabharata, even this is not quite straightforward. Souti, son of Lomaharshana, is who retells the epic to the assembled sages at Naimisharanya, at the sacrifice conducted by Kulapati Shounaka. But he in turn is describing what he heard from Vaishampayana at the sarpa-satra of Janamejaya, son of Parikshit. This is described in Adi Parva, and starts, in a very, very roundabout manner in Poushya Parva (Volume 1). 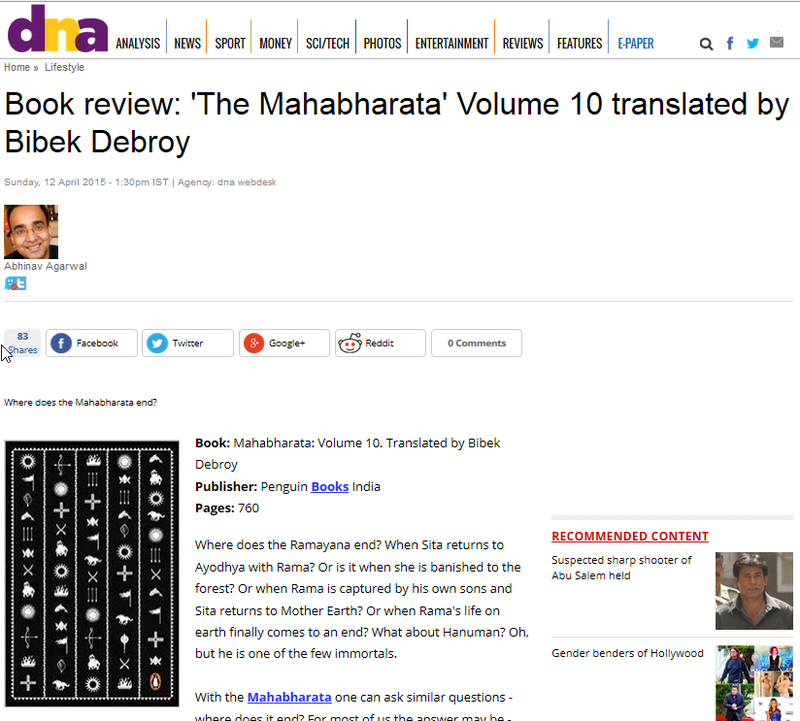 Dr. Bibek Debroy's unabridged English translation of the Mahabharata started in 2010, when volumes 1 and 2 were published. Thereafter, two volumes a year kept coming out, and the ninth and tenth volumes were published in December 2014, bringing to an end this mammoth effort. What began with Ugrashrava's retelling of Vaishampayan's account of what Vyasa wrote of what he saw take place in his family, and then some more, ends with the ninety-fifth parva. You know the famous quote about that which is not in the Mahabharata cannot be found in the world? That is also there in the epic - "Everything about dharma, artha, kama and moksha can be found here. What is here can be found elsewhere. But what is not here cannot be found elsewhere." In this tenth volume, Bhishma finishes his discourse to Yudhishthira, and then takes Krishna's permission, "O Krishna! O Vaikuntha! O Purushottama! Grant me permission." Krishna grants him leave. Yudhishthira is convinced to perform the great horse sacrifice - Ashvamedha yagna - and does so remembering what had happened the last time a great yagna had been conducted! Arjuna, through Krishna, had this message for Yudhishtira - "We should avoid a calamity at the time of offering the arghya." The sacrifice does go through uneventfully, but there is the appearance of a mongoose, who dismisses the great sacrifice thus - "This sacrifice is in no way comparable to the one that involved the giving away of one prastha of saktu." And who was the half-golden mongoose? A personified form of Krodha, cursed by Jamadagni's ancestors. There are really no straightforward endings along expected lines to be found in the epic! Fifteen years after the great war, an emaciated Dhritarashtra leaves for the forest, accompanied by the aged Gandhari, Kunti, Sanjaya, and Vidura. A year later Vidura dies, and two years after that Dhritarashtra, Kunti, and Gandhari perish in a forest fire. Sanjaya leaves for the Himalayas, never to be seen or heard from again (Ashrama-vasa and Putra-darshana Parvas). Dvaraka reaps the fruits of Gandhari's curse (Mousala Parva), Krishna is killed by a hunter's arrow, and half a million Bhojas, Andhakas and Vrishnis kill each other in a drunken stupor, or driven by fate and Gandhari's curse - depending on how you look at it. The Mahabharata is not a simple tale. It has no happy endings in the cliched sense, nor does it have any "happy ever afters" either. The decision to read the Mahabharata is also not a simple decision. There are retellings (Rajaji's classic or Devdutt Pattanaik's "Jaya" for example), creative adaptations (Chitra Banerjee Divakaruni's "Palace of Illusions" for example), or abridged semi-academic translations (as in John Smith's). In this tenth volume you will read the concluding part of Dana-dharma Parva, which is part of Anushasan Parva. 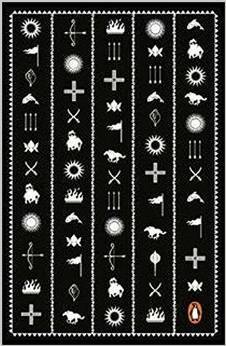 It contains the whole of Bhishma-svargarohana (Anushasan Parva); Ashrama-vasa (Ashrama-vasika Parva); Ashvamedhika (Ashvamedha); Ashrama-vasa, Putra-darshana, and Naradagamana (part of Ashramavasika Parva); Mousala (Mousala Parva); Mahaprasthanika (Mahaprasthanika Parva); and Svargarohana (Svargarohana Parvas). If you do want to read an unabridged English translation, the most obvious choice would be to read one based on the Critical Edition (the Critical Edition of the Mahabharata was published by Pune's Bhandarkar Oriental Research Institute over a period spanning nearly fifty years, and since its completion over four decades ago, has been the basis for many scholarly derivations and translations). Dr. Debroy's work is not only the latest - and a thoroughly enjoyable and impressively scholarly one - but as far as I can tell, the only completed complete translation based on the Critical Edition. The University of Chicago's series started in 1973, but is still not complete - the last volume came out in 2004. The Clay Sanskrit Library Mahabharata is based on the Nilkantha recension. P. Lal's of the Writer's Workshop is a poetic transcreation, and not strictly speaking a translation. Ramesh Menon's is based on Ganguly's Calcutta Edition from a century ago. As an interested student of the Mahabharata, Dr. Debroy's excellent work has kept me company over the last three years, starting with the first Volume 1 read in March 2012. Some six thousand pages and seventy-three thousand translated shlokas later, my journey too comes to an end. Another awaits, with his translation of Hari Vamsha, planed for 2016!